A Long March 2C rocket carrying two satellites blasts off from the Taiyuan Satellite Launch Center in China on Oct. 14, 2012. China successfully launched a Long March 2C rocket Sunday (Oct. 14), orbiting a pair of engineering research satellites to test new technologies in space, according to state-run media reports. The Long March 2C launcher lifted off at 11:25 a.m. Beijing time Sunday (0325 GMT; 11:25 p.m. EDT Saturday) from the Taiyuan space center in northern China's Shanxi province, a remote site about 265 miles (426 kilometers) southwest of Beijing. The state-run Xinhua news agency reported the launch was successful. China did not announce plans for the launch in advance. The Long March 2C booster was carrying two Shijian 9 demonstration satellites, state media reported. The rocket reached a near-polar orbit, according to U.S. military tracking data. Official Chinese reports did not identify what specific components the Shijian 9 satellites would test in orbit, but state media said the mission would focus on satellite reliability demonstrations and validating high-performance Chinese-made technologies. 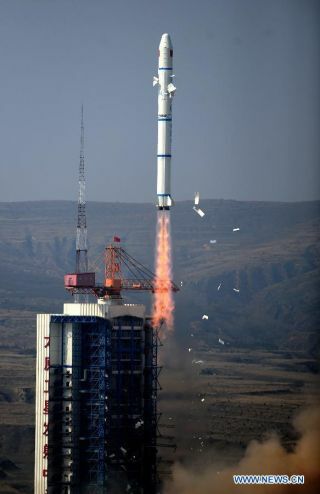 Sunday's launch marked China's 14th space launch of 2012 and the 56th mission to reach orbit worldwide this year.